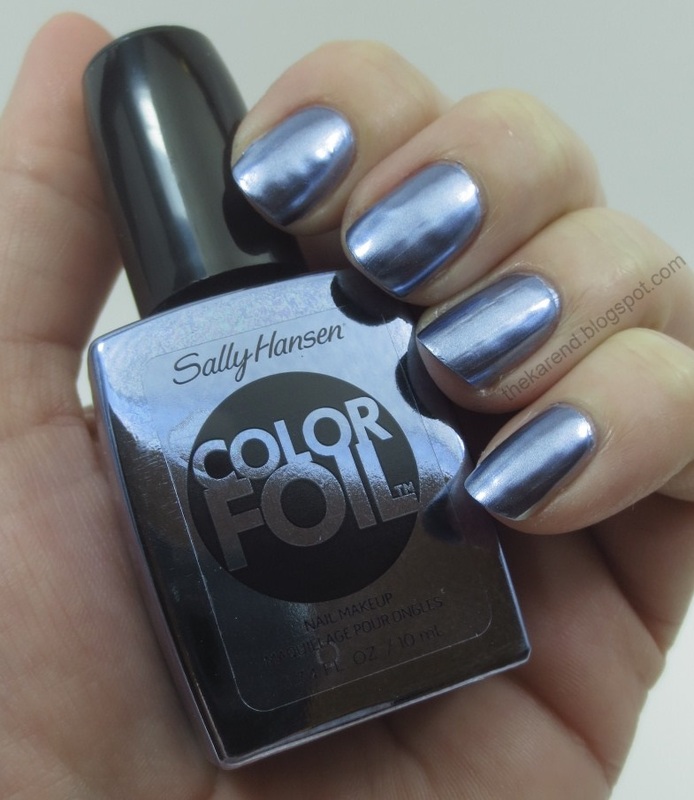 Since the Sally Hansen Color Foils seem to be a hot topic around the nailosphere, I'm going to jump ahead in my photo queue and share my swatches and comparisons now. I know I'll be out running errands this weekend; perhaps some of you reading will be doing the same. If you come across the Color Foil display while you're out and about, I'd like to think maybe I can help with your buying decisions by showing you what I found when I tried these. Let's start with the metallic colors (left to right): Liquid Gold, Yellow Gold, and Sterling Silver. These bottles are opaque and very shiny, so it was hard to take their photo without me or my camera being reflected in the shot. These are chromes, and like pretty much all chromes, they can be a challenge to work with. They tend to show every imperfection in the nail surface, for one thing. Because my nail surface is far from perfect, I wanted to use a base coat to smooth out my ridges and bumps. The Color Foils did not seem to care for either of my regular bases (Salon Sciences Instant Artificials or OPI Natural Nail Base Coat), perhaps because I didn't wait until they were super duper dry (I usually don't have to). They dragged and made bald spots and then formed odd ridges as they dried; it was not attractive. The directions on the back do say "For best results, use without base or top coat. ", but I was not willing to buff out all my ridges just for these polishes. My nails are weak enough after the harsh winter without subjecting them to what's basically sandpapering them. I had my Sally Hansen Gel Strips Kit close at hand because I wanted to use it to do my mani after I was done swatching, and thought to try using the gel topcoat as a base. I could cure it with the lamp and wouldn't have to wait, and it also has a nice smooth finish. The Color Foils did get along with this topcoat as basecoat approach, going on smoothly and drying with no weirdness. There were still some little bumps and imperfections because I am human, but the polishes themselves are very shiny. I was worried when I first put them on that they'd be brushstrokey, but most of the stroke marks disappeared as they dried (I might have had even better results if I'd done a better job of shaking them, but with the opaque bottles, you can't see how well the metallic bits have mixed in with the color). I used two coats of color, and that was plenty. Top to bottom below: Sterling Silver, Yellow Gold, Liquid Gold, Sterling Silver. Yellow Gold leans toward yellow green to my eyes. Same as above from a different angle (and the second finger of Sterling Silver cropped out due to extreme blurriness). Now let's look at the warm colors: Rose Copper, Pink Platinum, and Titanium Flush. Top to bottom below: Rose Copper, Titanium Flush, Pink Platinum, Rose Copper. All are two coats. Titanium Flush reads more pink to my eyes, close to red than Pink Platinum which leans a bit red-violet. What color is Titanium anyway? 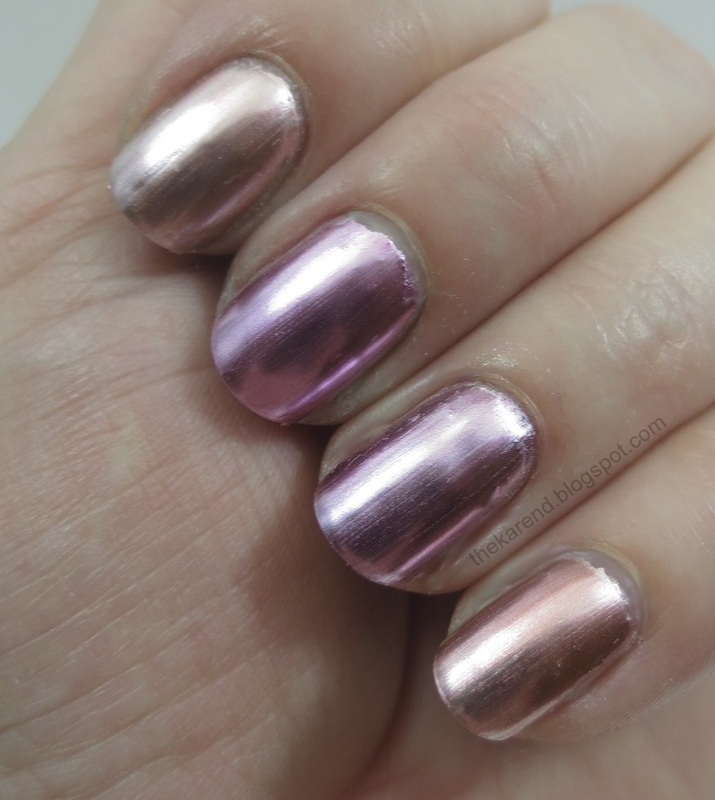 You may notice that Rose Copper is looking more silvery on my index finger than on my pinky; that's because I noticed when I did the second coat on my index finger that it looked like the color had settled out a bit so I shook it more before I did my pinky. These are also over the gel topcoat; I removed the silver and gold chromes with non-acetone remover and the gel underneath was still fine, so I didn't have to reapply that. Same as above but from the side (with second Rose Copper cropped). And finally the cool colors: Purple Alloy, Leaden Lilac, Cobalt Chrome, Minted Metal. I still had the gel topcoat on as a base at this point, but it was looking a tiny bit worse for wear around the edges after two rounds of remover, so I took that opportunity to see how these chromes would do over Nfu Oh Aqua Base, which is well known for taming tricky holo polishes. Thus I put a layer of Aqua Base over the gel, then applied two coats of color. 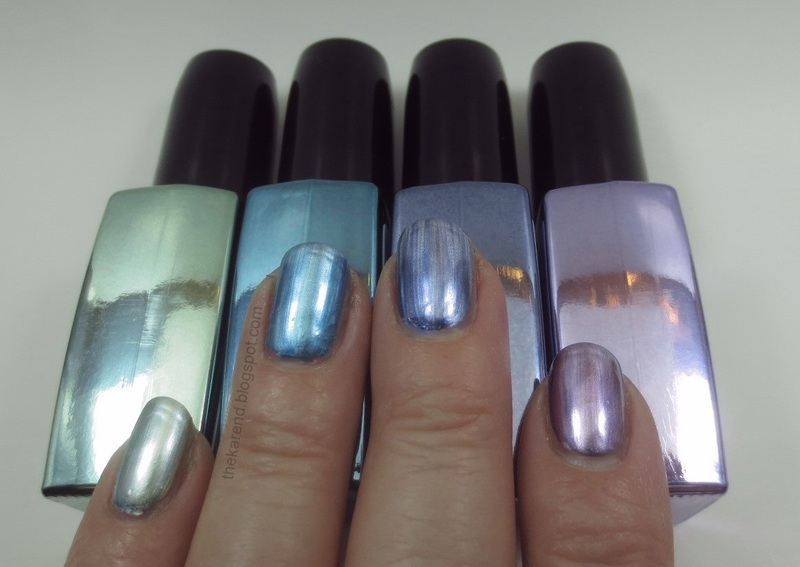 Top to bottom: Purple Alloy, Leaden Lilac, Cobalt Chrome, Minted Metal. The Color Foils did seem to like the Aqua Base; the only issue was I hadn't let it dry quite long enough and got some wrinkling at my tips from dragging the base layer as I applied the color. Opaque bottles aren't my favorite, but in the case of these four colors, it does appear they got the bottles to be a pretty good match for the polish inside. As you can see in the shot above on the Leaden Lilac finger, I continued to have trouble with shaking these sufficiently. I decided to really mix up Leaden Lilac and give it another try. This time, I took off the gel topcoat entirely. I did my usual Instant Artificials base, let it dry longer than usual, then added Aqua Base on top of that and tried to be very patient and give it time to dry as well. I still didn't manage to wait quite long enough, but even so this was my smoothest result yet. 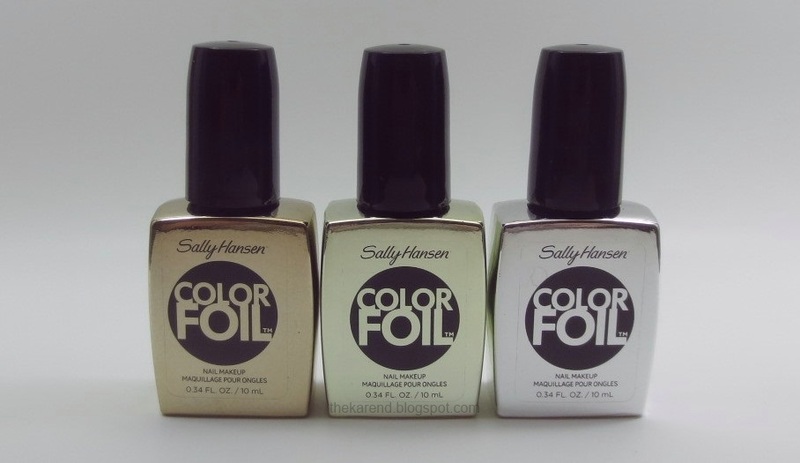 I could not resist doing comparisons with a bunch of these Color Foil colors, mostly to see how they matched up with the old school Chrome Nail Makeup colors that Sally Hansen put out back in the day (one of the days, anyway). These Color Foil bottles even say "Nail Makeup" on them (in tiny letters below the circle). I started with silvers, gathering Sally Hansen Chrome Nail Makeup Black Pearl, Chrome Nail Makeup Pure Chrome, Color Foil Sterling Silver, and OPI Push and Shove (from the not so long ago Gwen Stefani collection). 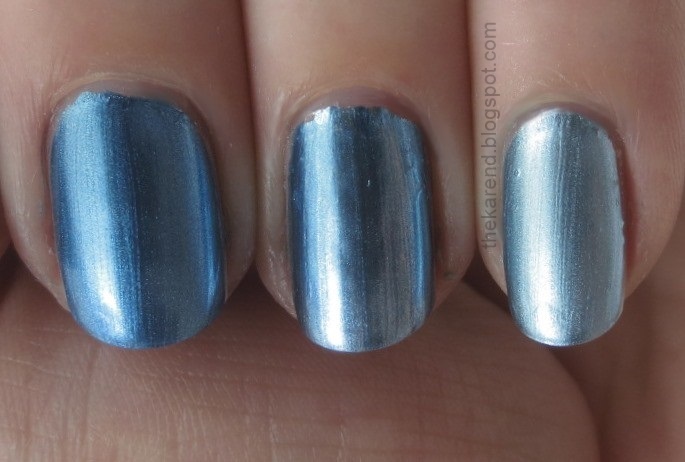 Here are the silvers on my nails, in same order top to bottom as the bottles are above left to right. (I went back to the gel topcoat as base approach here.) All of these are two coats. 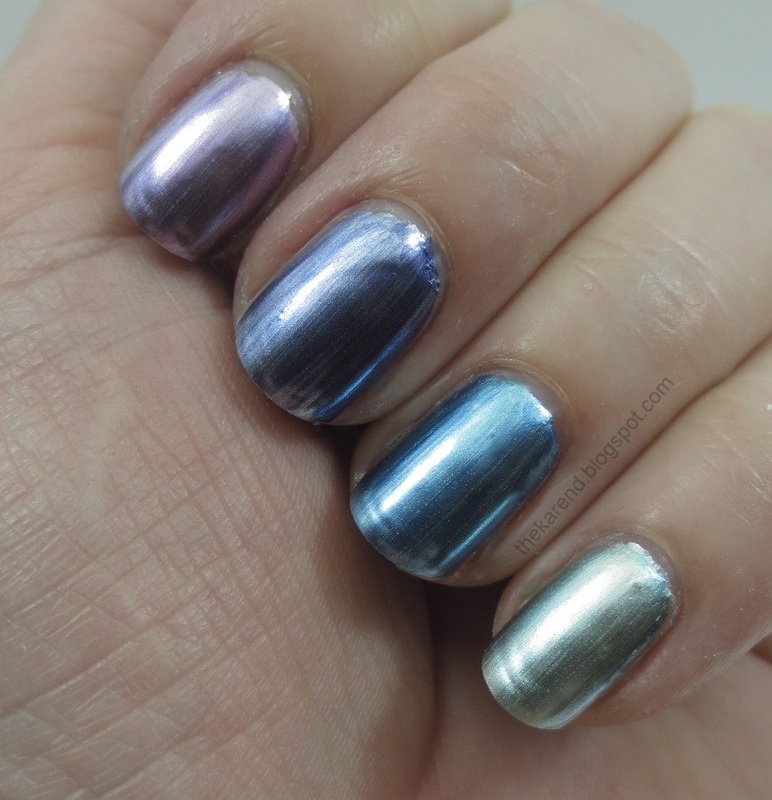 The new Color Foil is more chrome-y and less brushstroke-y than the old Chrome Nail Makeup ones (at least at this stage in their life), and very nearly a match for the OPI. 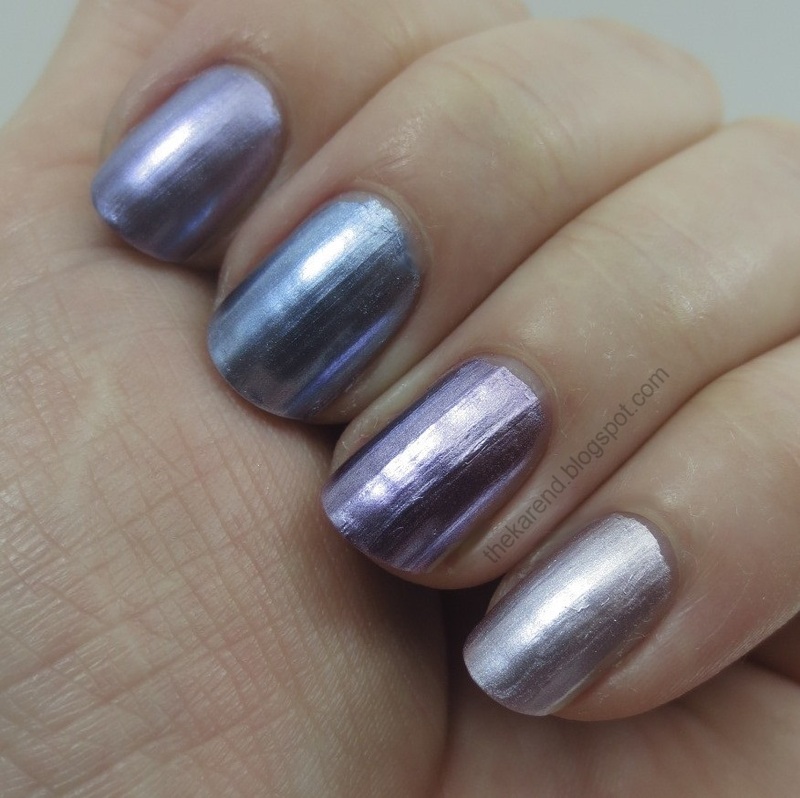 The old Chromes are more compatible with a variety of base coats, though; I tried these two oldies over both Instant Artificials and OPI Natural Nail and they were fine. 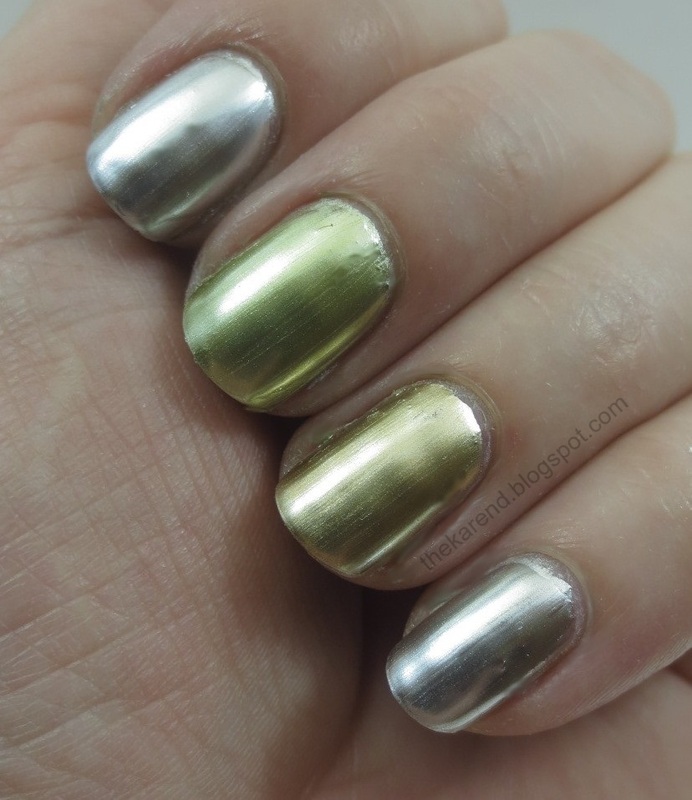 Since I'm not a huge fan of gold on my nails, I only have one gold Chrome Nail Makeup shade in my stash, so both of the Color Foil golds had to get matched up with that one. 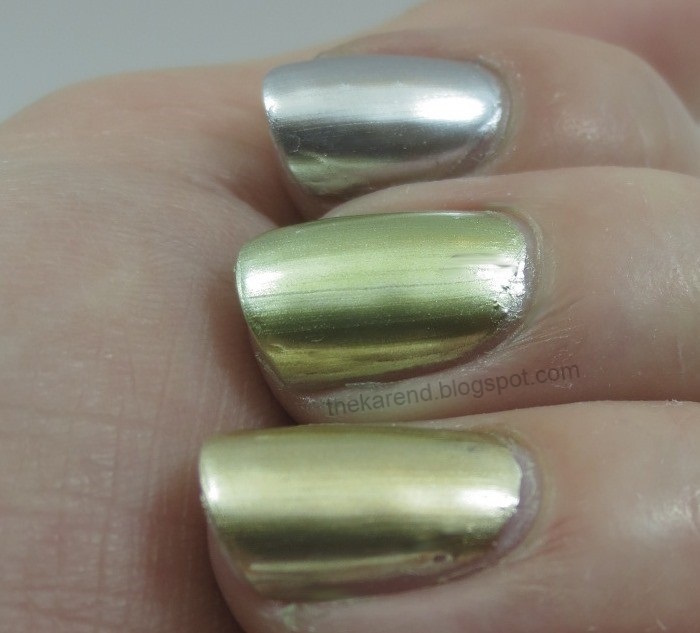 Left to right below: Color Foil Yellow Gold, Chrome Nail Makeup White Gold, Color Foil Liquid Gold. No dupes here, and again the finish on the new chromes is better than the old. I do wish they had a white gold in the new shade lineup, though. For the blues, I have to do a bottle shot to show how these shiny bottles don't necessarily age well. On the left, it's Sally Hansen Chrome Nail Makeup in Turquoise, which has lost most all the color from its finish (the blue you see is polish that dripped which I've left so I can see at a glance what's in there). 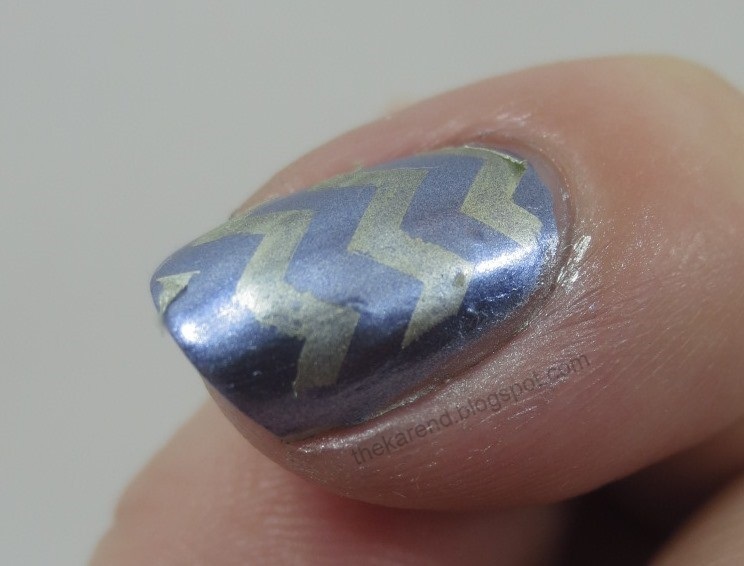 The middle is the new Color Foil Cobalt Chrome. On the right, it's Revlon Super Top Speed Chrome in Petal Chrome, which still has its color but only where the finish hasn't flaked off completely. 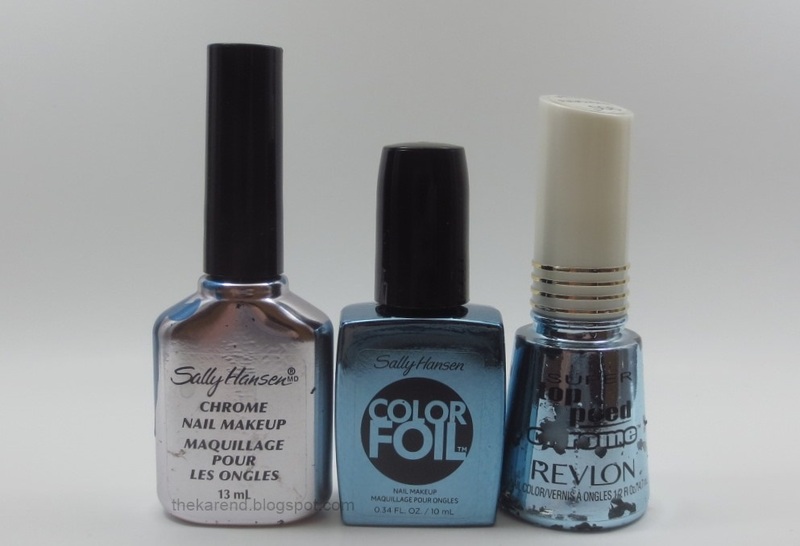 On the nail, left to right: Chrome Nail Makeup Turquoise Chrome, Color Foil Cobalt Chrome, Revlon Petal Chrome. All two coats over gel topcoat. Cobalt Chrome is a touch lighter than Turquoise Chrome, though maybe if I'd shaken Cobalt up more I'd get less silver in it. 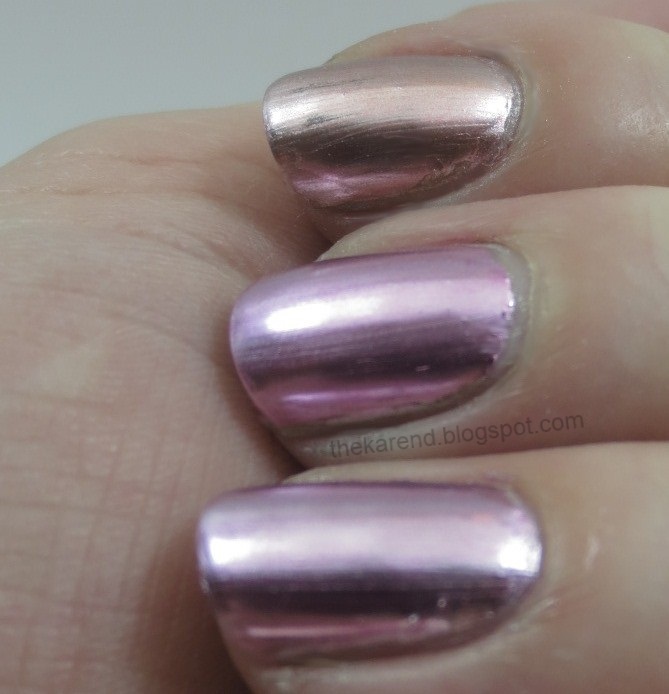 Petal Chrome is too light to be a dupe for either. 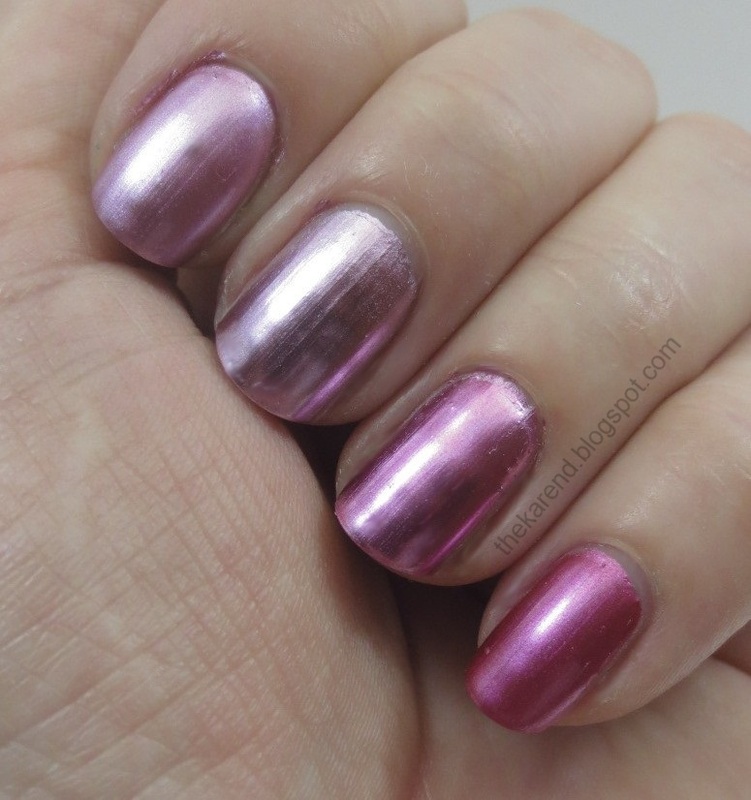 In the pink arena, I have (top to bottom on the nails below): Chrome Nail Makeup Ruby Chrome, Color Foil Pink Platinum, Color Foil Titanium Flash, Chrome Nail Makeup Carnelian Chrome. As with the blues, these are two coats over gel topcoat as base. No exact matches here, and the Color Foils make the old chromes look more like shimmers in comparison. The last comparison I have is the copper colors. Left to right below (again, no base coat): Chrome Nail Makeup Amber Chrome, Color Foil Rose Copper, Chrome Nail Makeup Rhodolite Chrome. 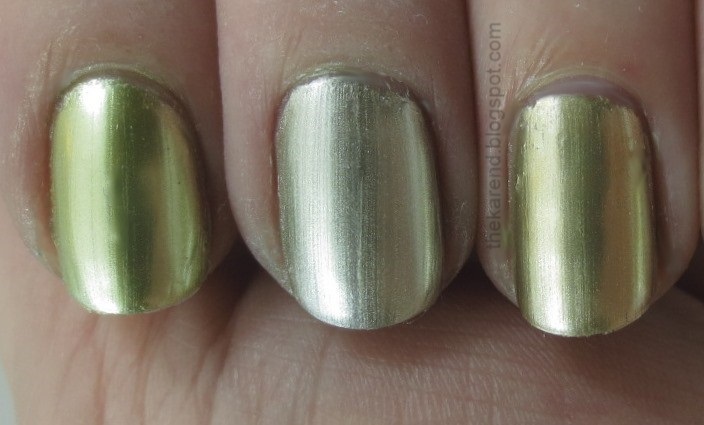 Just one more thing—I've seen people ask if the Color Foils stamp well, so I had to quickly try it on one nail. I am a very inexperienced stamper, and here's my first try with Yellow Gold (over Leaden Lilac). I think it turned out pretty well; would have been even better if I were faster with the scraper and stamp because these dry really quickly. I can only imagine how well these will work for someone who knows what she's doing when it comes to stamping, like the Canadian Nail Fanatic. To see these swatched on fake nail tips to get an idea how they'd look on super smooth nails, go see JenJen's post at Spotted. She got deeper colors from some of these; maybe it's the light or maybe she's really good at shaking them up first (these do seem to need more shaking than the old Sally Hansen Chromes). I'm conflicted about these Color Foils. On the one hand, it's exciting to see a collection that harks back to the good old days but is even better. (Fingers crossed for the return of Nail Prisms, too.) And they are beautiful if applied carefully on a very smooth nail. 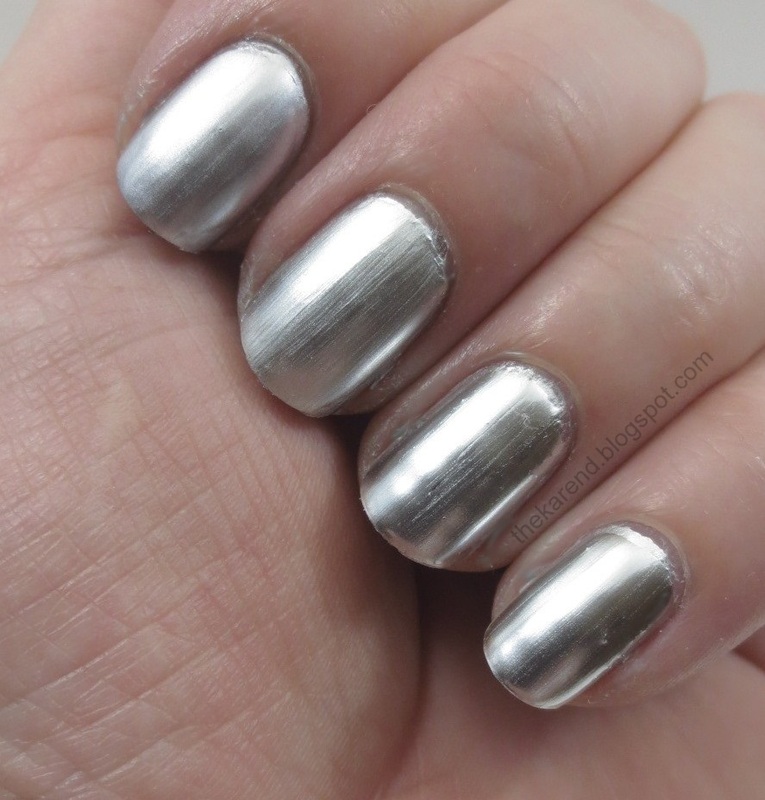 On the other hand, I'm not sure I'm willing to fuss with chrome finishes when there are so many easier ways to dress up my nails. EEEEEEEEE Thank you for this! I'm am so excited and I appreciate the comparisons! 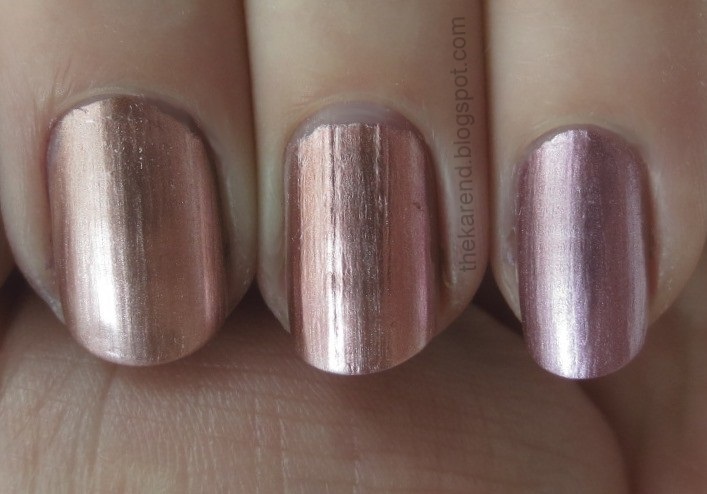 The foil finish is really a nice foil - great swatches! Just a reminder: you are awesome!!! Unfortunately I haven't seen these yet. Very excited over Leaded Lilac!!! Thank you, thank you, for the swatches! Quite a few of us have been anxiously waiting for this collection and have wondered how they would be. Your swatches are excellent - and again thank you, for the comparisons. I know they are more trouble than cremes and such but they are so lovely and I don't figure on wearing them all the time. However, I do need to invest in something that will fill my ridges. Will look into your suggestions! Thank you for the great photos. I've been looking forward to hearing about these...and thanks for all your testing with different bases, etc. Seems like a lot of work. I have a few of the old SH's and will probably only use them for stamping and will probably use what I have already. It does seem that they are less brush strokey which is good news if anyone want to fiddle with the base! I feel so out of touch! I hadnt heard about these. Great review! I think i'll pick a few up. 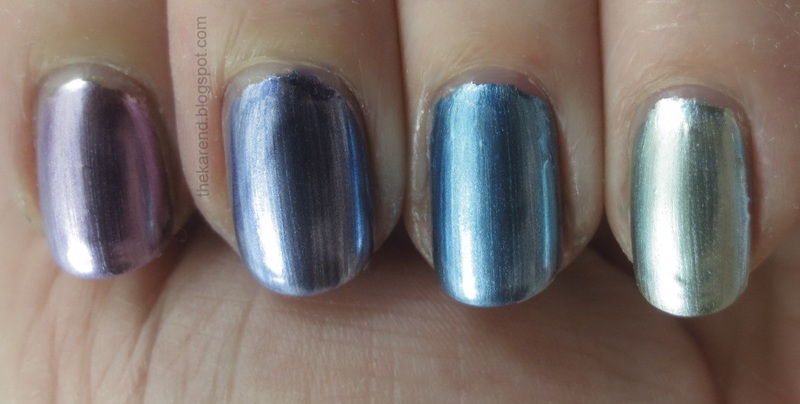 It seems that silver is pretty comparable to the OPI. I wonder if they'd be easier to apply over aqua base. Fantastic, thank you! Have you wore any of these for a few days? Since they look close to the OPI Gwen Stefani polish, I wonder if they have the same wear problems (that one is not designed to last more than a day?). 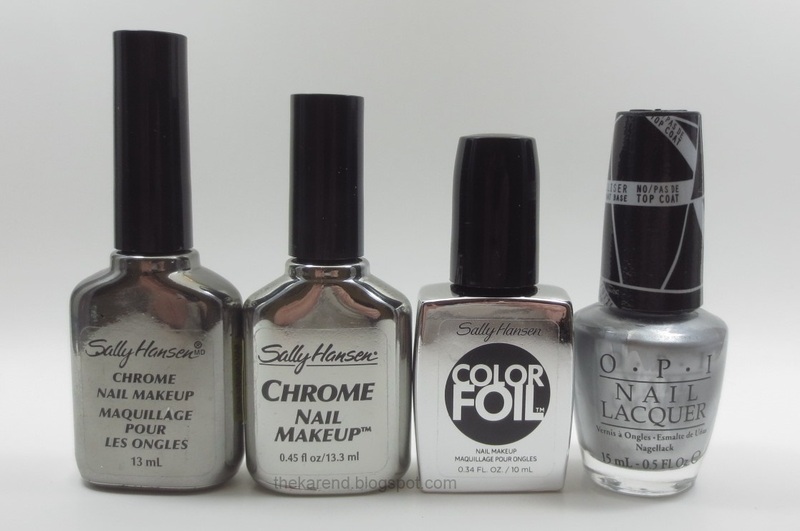 My old silver Sally Hansen chrome actually wears quite well, though apparently isn't as shiny as these. Lyn, I have not worn any of these for a full mani yet. I wouldn't be surprised if they aren't very durable, since they're supposed to be worn without topcoat and chromes are notorious for not holding up. Thanks for the hyper detailed post!! Actually I shouldn't bother about these SH, because they won't be available here (at least not in most common stores), but I really enjoyed reading about your tests. So useful, I think that there's nothing like a swatch on real nails (wheels and sticks are useful, but cannot be reliable in terms of opacity and effect on nails IMHO). I've got quite ridged nails, so chromes are not my cup of tea, especially if the are unforgiving with nails imperfections...But I love them for stamping (as I do with my Kiko Mirrors)! Fingers crossed for a SH Prisms "reloaded", that would be interesting!! What a fabulous post! Great pics and comparisons. Now I know that CF Titanium Flash and CF Yellow Gold must be mine! Out comes the ridge filler for me. How is the chipping? I just can't stand the chipping, as soon as it chips it's off. Lucky you for being able to get these!